WASHINGTON — House Minority Leader Nancy Pelosi's comments about sexual harassment allegations in her party's own ranks touched off a fierce blowback not only from Republicans, but also from progressives, who said they feared it muddled the Democrats' message on misconduct by putting politics ahead of protecting women. In an interview Sunday on NBC's "Meet the Press," Pelosi, D-Calif., offered supportive words for Rep. John Conyers, D-Mich., who has been accused of sexually harassing former members of his congressional staff and who reached a taxpayer-funded settlement with one accuser who said she was fired for rejecting his advances. Pelosi praised Conyers, who has denied the allegations, as an "icon," questioned the identity of his accusers and declined to call for his resignation — all within moments of having hailed the "zero tolerance" movement against sexual misconduct as "transformative ... so wholesome, so refreshing, so different." Pelosi's comments were criticized as tone-deaf and a bad flub — one that diluted the message that Democrats want to be sending on sexual misconduct, particularly in light of Roy Moore's Senate campaign in Alabama and President Donald Trump's support for him. "I'm trying to think of a political interview in recent history that's been as damaging to a politician, simply because she was so unprepared and could not answer questions about a huge crisis that is sweeping across the nation and so many industries, not just politics," said Elise Jordan, a Republican strategist and MSNBC analyst. "I think that Democrats on Capitol Hill are underestimating the movement that's happening right now and the tenor of the nation when it comes to zero tolerance for sexual harassment and sexual assault. It's another example of Washington protecting their own — they're protecting the boys who are in the club," Jordan added. "It's about the ties of the club, the bonds of the club, and no one will defy that even when it's a question of morality and standards from the party that ostensibly says they support women." As Democrats also wrestle with groping allegations against Sen. Al Franken, D-Minn., Pelosi's remarks raised questions about the credibility of the party's messaging and the degree to which its elected leaders are willing to put the protection of women ahead of political considerations. Some Democrats worried that they came at the cost of drawing a distinction with Trump and Moore. "We have no moral high ground against the likes of Roy Moore if we sit by in silence when Al Franken and John Conyers get to sit in their seats," Democratic strategist Lis Smith said. "We can't be the party that says we stand up for women only when it's politically convenient — we have to apply the same standards to ourselves." Amid a torrent of criticism from progressive activists — and as Republicans called her a hypocrite — Pelosi tried to limit any fallout. Conyers, who Democratic aides said already had agreed before Pelosi went on camera Sunday to temporarily step away from his post as the top Democrat on the Judiciary Committee, made his plans public shortly after her appearance. Then Pelosi issued a her own statement after the interview, stressing the seriousness of sexual misconduct allegations. "Zero tolerance means consequences," Pelosi said in the later statement, noting that she had called for an ethics investigation into Conyers. "We are at a watershed moment on this issue, and no matter how great an individual's legacy, it is not a license for harassment. I commend the brave women coming forward." Several Democratic lawmakers declined to make on-the-record comments about Pelosi's remarks, not wanting to make a bad situation worse for her. Some junior members of the Democratic caucus have long grumbled that Pelosi should consider stepping aside to allow younger leaders to rise and because they fear that the Republican Party will try to make an issue of her in the midterm elections next year. 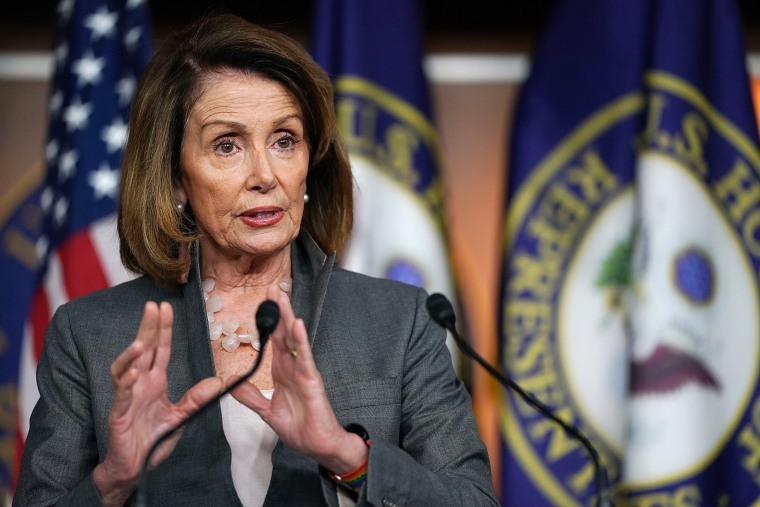 But one lawmaker and two veteran Democratic aides said Sunday that they didn't think the interview would cost her support among House Democrats. "This is not going to move the numbers in any substantial way," the lawmaker said. But for the silence about Pelosi's comments among Democrats in Congress, beyond the Capitol, there was concern that Democrats need to speak clearly on the issue of sexual misconduct. Nomiki Konst, a former member of the Democratic National Committee and a surrogate for Sen. Bernie Sanders' 2016 presidential campaign, said Democratic leaders are in a "prickly position" when lawmakers who have advanced women's rights are themselves accused of sexual misconduct. "There is no doubt that Nancy Pelosi is a feminist and that she has stood by women," Konst said, "but this is a moment when we really need to say, 'How are we going to look back on this in 20 years?'"